Colombia's Presidential Election Moves To A 2nd Round Pitting Right Against Left : The Two-Way Right-wing candidate Ivan Duque won a place in Colombia's June presidential runoff against leftist Gustavo Petro. That has some worried that a fragile peace pact with Marxist rebels could unravel. Ivan Duque, presidential candidate for the Democratic Center, and his vice presidential candidate Marta Lucia Ramirez, raise arms after winning the first round of Colombia's presidential election. A runoff with Gustavo Petro will be held June 17. Colombia on Sunday held its first presidential election since a landmark peace accord ended a 50-year-old guerrilla war. The battle to lead the country now goes to a runoff next between two ideological opposites and the race is expected to be contentious. 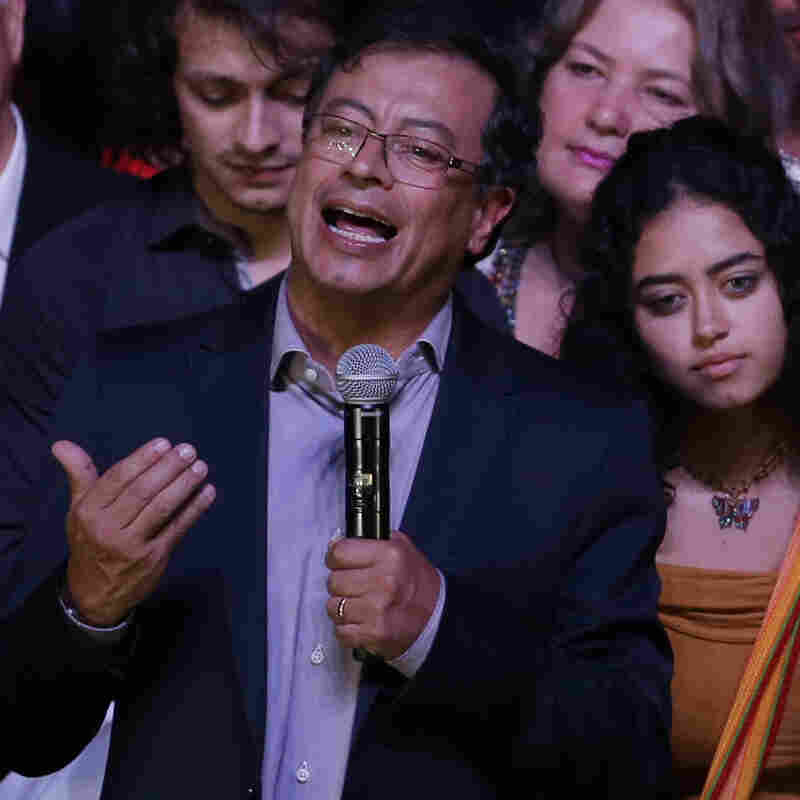 Right-wing candidate Ivan Duque, a former senator, took first place, and will run against leftist Gustavo Petro, a former mayor of Bogota and a one-time rebel. Of the 19 million votes cast, Duque won 39 percent — missing the 50 percent mark needed to avoid a runoff. Petro received 25 percent. Gustavo Petro, presidential candidate for Colombia Humana, speaks to supporters in Bogota Sunday. Petro, a former leftist rebel and ex-Bogota mayor, came in second place behind former senator Ivan Duque in presidential elections. Third-place finisher Sergio Fajardo, got nearly 24 percent of the vote, and his portion is likely to be decisive in the runoff. He has not indicated which candidate he will support. Duque has had the support of former Colombian President Álvaro Uribe, who is constitutionally barred from running for a third term. Uribe is immensely popular for ordering devastating military attacks on Colombia's guerrilla groups during his two terms in office. NPR's John Otis in Bogota reports that, "With Uribe's support, Duque shot to the top of the polls. Critics fear that Duque could become a kind of puppet president with Uribe pulling the strings. But Duque insists he's his own man." Second-place finisher Petro and his populist "Humane Colombia" platform have drawn comparisons from critics to the late Venezuelan socialist leader Hugo Chavez, who Petro once admired. The Associated Press reports: Petro describes himself as a "strong adversary" of the neighboring country's current president, Nicolas Maduro, but his early ties to Chavez have dogged him throughout the campaign. Whoever wins the runoff and becomes president will have a big say in the future of the peace agreement. The accord ended a war that killed 220,000 people and has vastly reduced violence. Petro supports the peace treaty but Duque has promised to rewrite it. John Otis reports, "Duque claims that it's too lenient on former rebel fighters. For example, those accused of war crimes can avoid prison. And Duque's supporters can't stomach the fact that the treaty has given 10 former guerrillas seats in Colombia's congress." 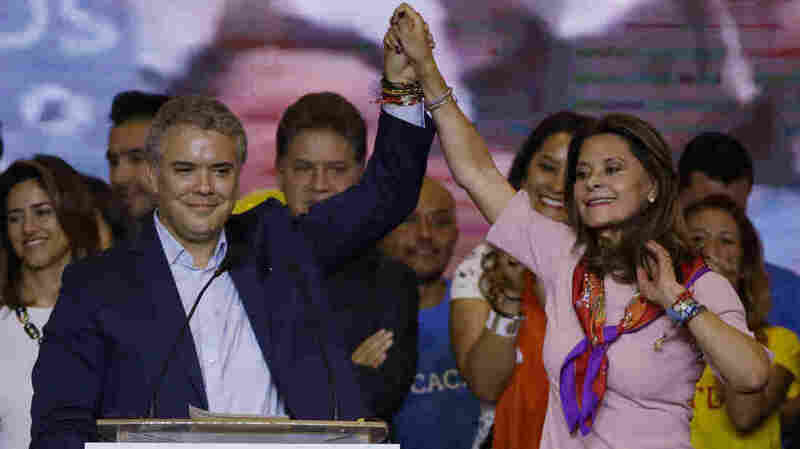 Ramiro Bejarano, a columnist for El Espectador newspaper, tells The Associated Press that "Duque's 14-point advantage will be hard to surmount for Petro, whose main challenge is to convince voters he won't convert Colombia into another Venezuela." While most polls have Duque the favorite to win the June 17 runoff, Petro shouldn't be counted out.